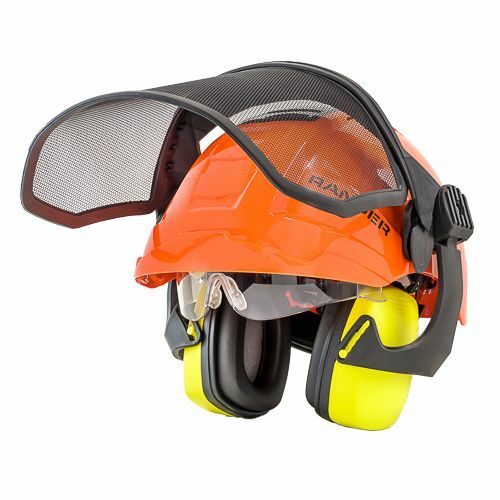 This kit represents the perfect blend of a standard forestry hard hat and a modern climbing helmet, plus it has the added bonus of Rockman's patented CrashBox suspension and safety system. To envision how this safety system works, Rockman encourages you to picture the function of "crumple zones" on modern vehicles (see the Video tab for more information). The helmet uses a combination of rods and pipes, which compress into one another and deform upon impact, directing energy and force into the helmet itself, instead of onto your head. 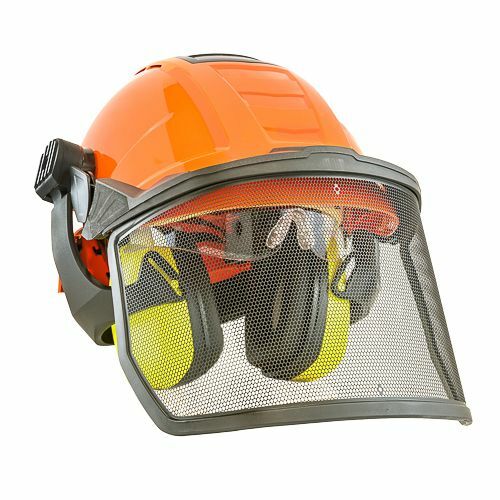 Other cool features include a stainless steel mesh visor that reduces light transmittance by up to 70%, while most other visors on the market only offer 50%. Ear muffs are also included, and can be placed in three different positions at the user's discretion. This allows for maximum comfort while the muffs may be placed in and out of service as the helmet is worn. Additional features include retractable safety glasses and a magnetic chinstrap that is easy for the user to attach, even when wearing gloves or working in cold conditions where dexterity is reduced. The system is entirely designed and manufactured in Germany. Well, this may be a question of semantics, as we believe you could make a case either way. Ultimately we decided to place this helmet system into our climbing helmet category because the helmet itself really does have a smaller-than-average profile compared to a standard hard hat. That said, it is suited for both ground or climbing work. In the end, the user will have to make the call, as we feel this helmet system probably fits somewhere in between a traditional hard hat and a modern climbing helmet. But with all the features--both comfort and safety--and for the price, we don't think you can go wrong. Are the ear muffs removable? Yes, but it appears the mesh face shield and ear muffs are integrated, so removing one means you remove the other. Is the drop down clear lens removeable? Yes it is. It is held by plastic screws, which are removable. Is this helmet available in an XL? At this time we only offer the one size. The helmet does have an adjustable suspension designed to fit "most" users. Does the integrated eye protection accommodate prescription glasses? If you're talking about the clear safety glasses that are included, then the answer is no. You would need to choose between those and your regular prescription glasses.